Descend from the Western Ghats to the Tirunelveli plains and quite suddenly, all around you, are paddy and banana fields, as far as the eye can see. This is Nanguneri taluk, a verdant and beautiful part of Tamil Nadu, reminiscent of the iconic opening scene of Mani Ratnam’s Roja (1992). Tirunelveli is famous for its bananas. Since the cash crop found a home there in the 1940s, it has become an indispensable part of the region’s agricultural economy. Today, India is the largest producer of bananas in the world, growing 29,163,000 metric tonnes of the fruit in 2016-17, according to “Horticultural Statistics At A Glance 2017". Tirunelveli is among the largest contributing districts, ranking third in terms of area covered by the banana crop. The banana is cultivated so heavily across the country that it takes up 13% of the total land devoted to fruit crops, according to the National Horticulture Board’s database. Roughly, one in every three pieces of fruit grown in India is a banana. There is year-round demand, and retail prices, especially in urban centres, have been rising steadily. So why are the farmers of Tirunelveli suffering? Due to a number of factors, the greatest benefit from this trade goes not to the farmers but to a string of middlemen. The Thamirabarani Farmers Producer Company Ltd (TAFPCO Ltd), a farmers’ producer organization, or FPO, is trying to address this issue. Set up in June 2016, it operates out of the small town of Thirukurungudi, and is helping farmers access government aid schemes. One of the ways in which farmers can benefit, for instance, would be subcontracting transportation so that they have more of a say in fixing prices. An FPO is a form of farmer collectivization that is gaining popularity in various agricultural sectors in India. These are companies formed by 10 or more farmers, registered under the Companies Act, 2013, that help small and marginal agriculturists face challenges: fragmentation of land holdings, inadequate access to credit, technology, extension services for loans and markets. Through the FPOs they belong to, farmers are also eligible for Central and state government schemes, such as those offered by Nabard, the National Bank for Agriculture and Rural Development. “If I sell a banana bunch for Rs10, by the time the retail store buys it, the rate has gone up to Rs80," says B. Rangaraj, a farmer and member of TAFPCO, while cutting bunches of red bananas to send to the auction market in Nagercoil, 45km away. “I see only a paltry sum for my efforts. It’s the various brokers who end up pocketing most of the profit. Until this equation changes, farmers can hope for nothing more than survival." ‘Nendran’ being transported to the market. “It’s said that there are certain banana varieties like the pachanadan and matti that can even be used as a substitute for mother’s milk to a newborn," says Wilfred Fernando, who was instrumental in setting up TAFPCO. Though he now lives in Chennai, Fernando is well-versed in banana cultivation, having grown up in Tirunelveli. He still has farmland in the region. Fernando and his son Walter hope to change the way bananas are bought and sold in Tamil Nadu. “It is unique to our region that as many as 18 different varieties are cultivated," he adds. “Tamil Nadu, especially the Tirunelveli region, is probably the only place in the world this is happening." Globally, the banana industry is dominated by two varieties, the Cavendish and dwarf Cavendish. While these are as tasty and nutrient-rich as any other banana, extensive monoculture makes Cavendish banana plantations highly susceptible to disease. As one Cavendish plant is essentially a clone of another, a pathogen that affects one plant can end up destroying an entire plantation. Diversity in banana varieties prevents this. This is the key reason Tamil Nadu is the fifth-largest banana-growing region in the world. According to the state’s agriculture department, the average banana yield in Tamil Nadu is 100 metric tonnes per hectare, against a national average of 37 metric tonnes. The state’s annual banana production is 6.2 million tonnes, with 300,000 hectares under cultivation. The problem for the farmer comes when it’s time to sell. “The brokers are like a mafia," says Fernando. “They observe developments in the industry and advance money to the small farmers during the cropping process." An average banana plant needs between eight and 10 months of care to produce a good yield. “So when the time comes to sell, the broker has this unwritten bond with the farmer and can buy at whatever price suits them," Fernando continues. “With unpredictable weather and climate change, the situation for the farmer has only become worse." A farmer near Thirukurungudi cuts bunches of the ‘karpuravalli’ variety, which will be ripened before it’s ready to be sold. Like other forms of labour collectivization, FPOs help address the concerns of farmers. There are around 700 FPOs in India; Tamil Nadu has about 70, with TAFPCO the latest to join the club. They’re proving to be a game changer, since over 85% of India’s 125 million farming households have holdings of less than 2 hectares. In fact, the model, only a few years old, is proving highly successful for different crops in various parts of the country. “We have about 500 farmers enrolled in the organization and we’re hoping to rope in more from this region over the next few years," says S. Nallakannu, a young farmer from Kattalai village who is also one of the directors of TAFPCO. Nallakannu, a BSc (botany) graduate, is showing me his 4-acre banana plantation. It is a searing afternoon but, in the shade of the banana trees, a cool breeze filters through the leaves. The daily-wage workers, all women, have finished collecting the dried leaves and shoots and are sitting down to lunch near a shed where the tools and fertilizers are stored. Nothing goes to waste in a banana plantation—collected material is reused as compost. “Through the FPO, we’re able to avail the benefits of various government schemes, which takes care of our overhead costs," Nallakannu says. “We’re also looking to sell directly to buyers and take brokers completely out of the equation." Instead of the existing set-up wherein produce is taken to the market, auctioned and then sent to the retailer, there is an effort to establish a direct supply chain with retailers. Two retailers in Chennai and Bengaluru are now supplied directly by farmers. While TAFPCO is now among the largest FPOs, with 510 members, in India, cyclone Ockhi last year, and the drought the year before, took a toll on the banana business. “We’re hoping this year there are no surprises," he says. “We’re also growing organic variants but it will take some time to scale this up. Our main focus now is for the farmers to get a good rate. Whatever profit we make, we will be sharing equally among all the members." In the proposed scenario, the FPO will act as the marketplace, ensuring that sale profits reach farmers and the supply chain is transparent. Cutting out middlemen will mean no “cuts" and sale to end consumers will be directly from the FPO. We’re there on a Sunday, which is also the busiest day on banana plantations. This is when the week’s biggest auctions, usually held twice a week, take place. Once purchased, the bananas could be on their way to Delhi or Dusseldorf. “Last week, the price was good, but we’ll know about today only after the market in the evening," says Gnanamuthu R., who is supervising the loading of a consignment of yelakki bananas into a pickup truck. “As farmers, we’re at the mercy of nature, middlemen and the government. There are signs of this changing here. Hopefully, it comes through." 1. Rasthali: Grown in Tamil Nadu, Andhra Pradesh, Kerala, Karnataka and Bihar, it has a unique taste and good aroma. 2. Poovan: It is a leading banana crop that is grown commercially throughout the country. Tamil Nadu is the leading producer owing to its climatic and marginal soil condition. 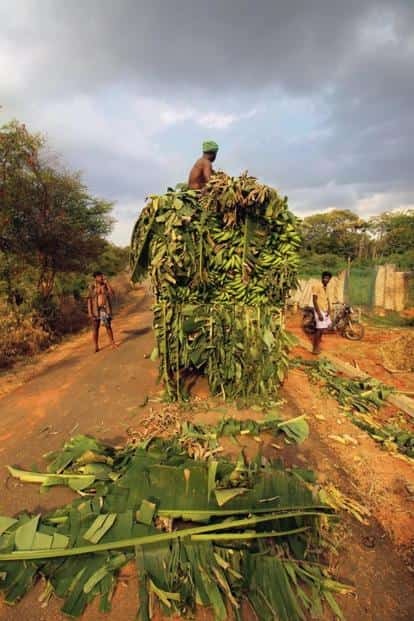 Poovan is also commercially cultivated for the leaf industry throughout Tamil Nadu and in certain parts of Kerala. 3. Nendran: A popular variety in Kerala, its cultivation has increased in Tamil Nadu in recent times. The fruit has a distinct neck with the thick green skin turning buff yellow on ripening. 4. Red banana: Red banana is a highly prized variety from Kerala and Tamil Nadu. Its commercial cultivation is prominent in the Kanyakumari and Tirunelveli districts of Tamil Nadu. It is also popular in Karnataka, Andhra Pradesh, and, to some extent, in western and central India. In Bihar and other regions, it is popular as lal velchi, and in Karnataka as chandra bale. 5. Ney poovan: The ney poovan is a slender plant bearing bunches of 15-30kg after 12-14 months. The dark green fruit turns golden yellow as it ripens and keeps for days. The fruit is highly fragrant, tasty and firm. In Kerala, it is grown in backyards and is now shifting to large-scale cultivation. 6. Pachanadan: It is a popular variety in Tamil Nadu grown especially for its cooling effects in summer. The variety comes up well in marginal soils without any yield reduction. It is well suited as an intercrop in coconut/areca nut farms.